Crafted from solid seasoned spruce top, maple back, sides, neck and scroll, ebony fingerboard, maple pegs, tailpiece, chin rest and endpin, maple bridge, DíAddario Prelude strings, four string adjusters and nylon tailpiece adjuster. Made in China. Set up and adjusted to MENC specifications. Finding an all solid, hand-carved, violin outfit using premium aged, flamed and book-matched woods has been unheard of until now. Now thanks to Saga, this is an amazing instrument that all can afford. The one-piece, highly-flamed back on every Cremona sv-1260 Maestro Violin Outfit must be seen to believe. Only the finest select woods are chosen for production of each instrument to enhance the already amazing tone of these superb "First" violin outfits. 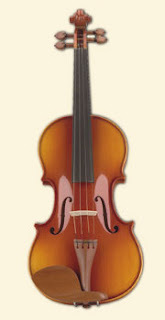 The SV-1220 by Cremona is a superb "First" violin. Well beyond a begining students instrument in everyway, from its select woods and high-end features, to its astounding tone. It will bring the player a lifetime of enjoyment. Crafted in Romania of well-seasoned woods with graduated solid spruce top, solid maple back, maple sides, solid maple scroll and neck, inlaid purfling, ebony fingerboard, pegs, nut, saddle and tailpiece, maple bridge, composite chinrest, four string adjusters, D'Addario Prelude strings and nylon tailpiece adjuster. Polished red-brown satin finish. Set up and adjusted to MENC specifications. Includes canvas covered wood case and wood horsehair bow.